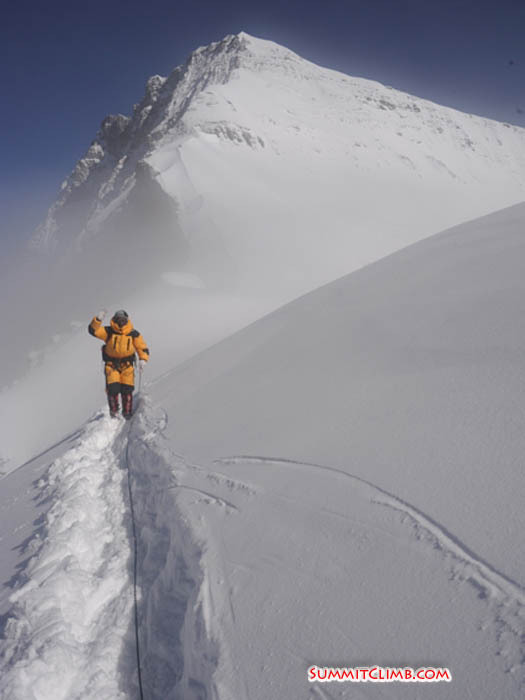 Introduction: This year, during May, our team placed 11 out of 14 members and 9 Sherpas on the summit of Everest via the Tibetan North Col Route. This was the best record of any team. Also we had a fantstic season of trekking and North Col Training Climbs. 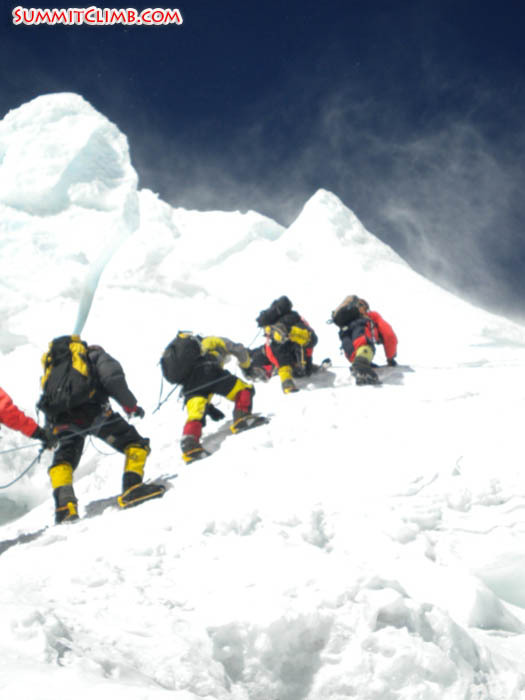 We congratulate all of the members and Sherpas on a job well done. Also we would like to thank the families, sponsors, friends, and colleagues of the members for all of their fantastic support. We could not have done it with out you. Thank you very much!! 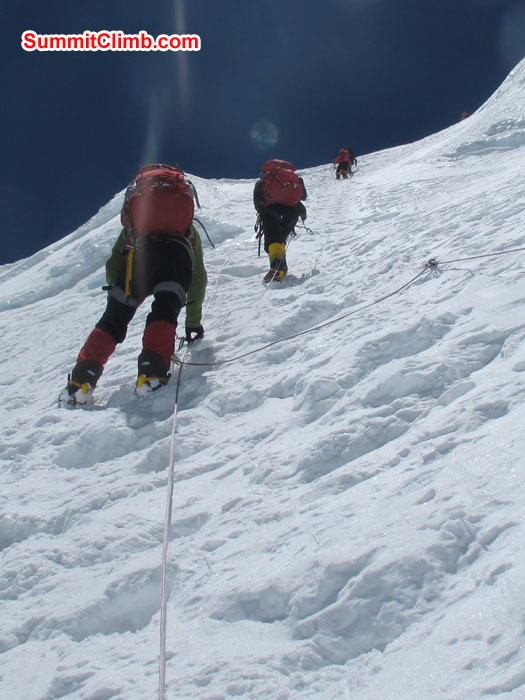 View our links for more information about our Everest Tibet and North Col Training Climb expeditions, as well as Advanced Basecamp Treks . We are now accepting applications for Spring 2014, so please join us for Everest, Lhotse, Cho Oyu, the North Col and our treks and trekking peaks. All members are back in ABC safe and sound! Today our yaks will arrive in ABC and tomorrow they will carry everything down to BC. The Sherpa's are still working very hard to carry camp 1 down today. Summit of Everest on 23 May 2013, Rikke Hojland and Ang Dorjee Sherpa. Photo Rikke. 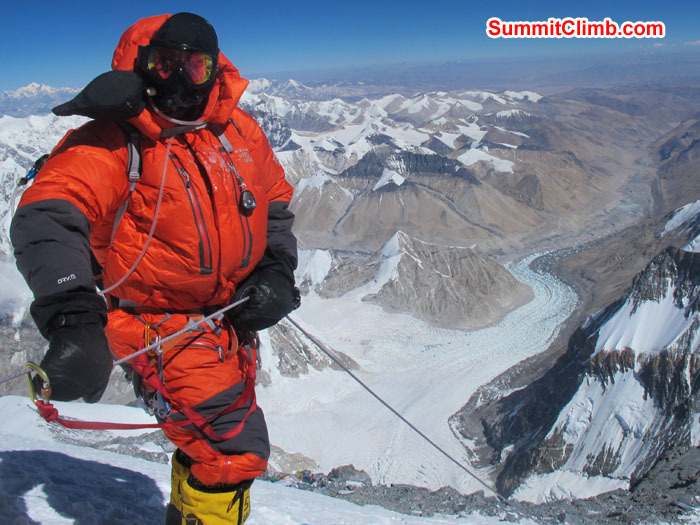 Rikke Hojland summit of Everest on 22nd May 2013. Photo Rikke. Team Summited. Photo David O'Brien. 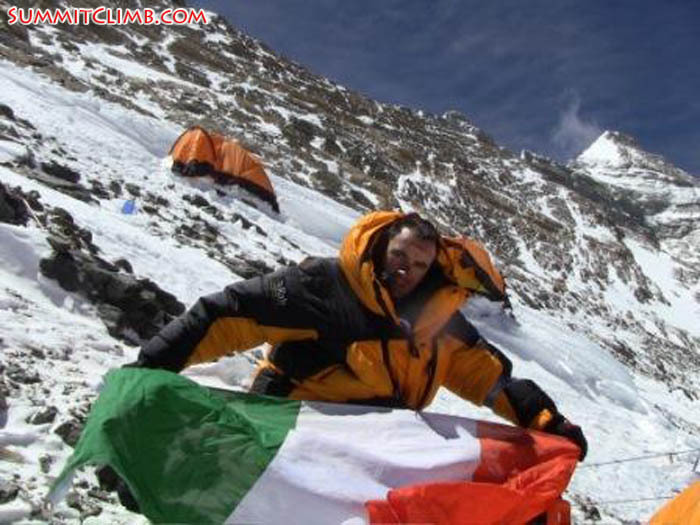 Payer flag on the summit of Everest. Photo David O'Brien. 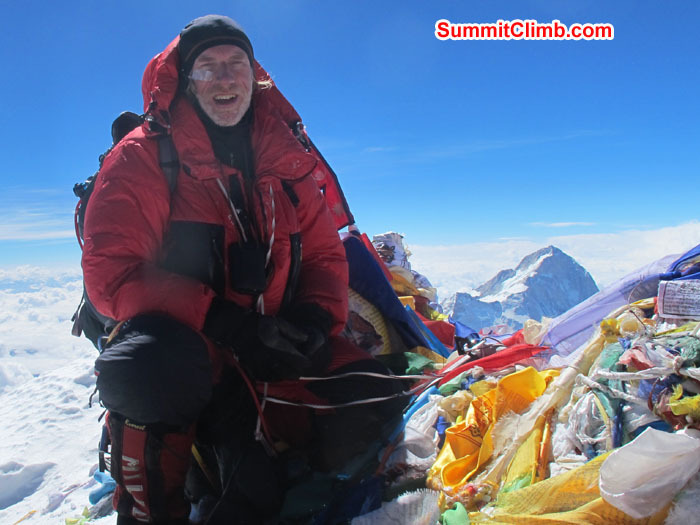 Chris Bailley at the summit of Everest. Photo Chris. David at summit of Everest. Photo Chris Bailley. Summit Day. Photo Chris Bailley. 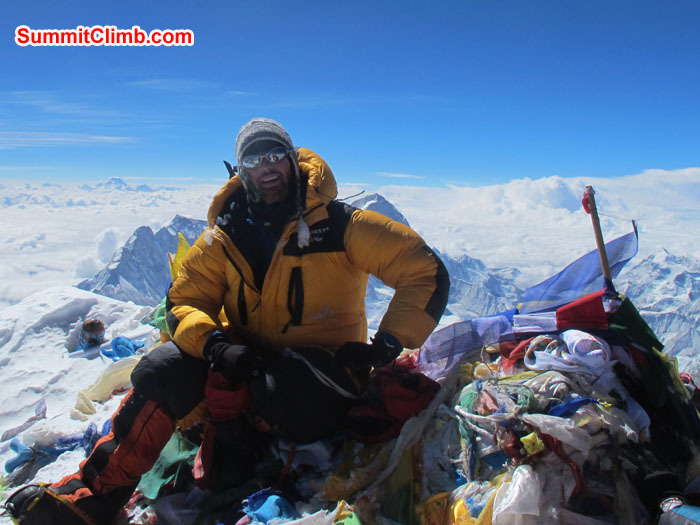 Self shot at summit of Everest. Photo David O’Brien. Team back down in camp 3 after a successful summit of Mt. Everest. Team heading back down to the North Col. Member above camp 3 after the summit attempt. 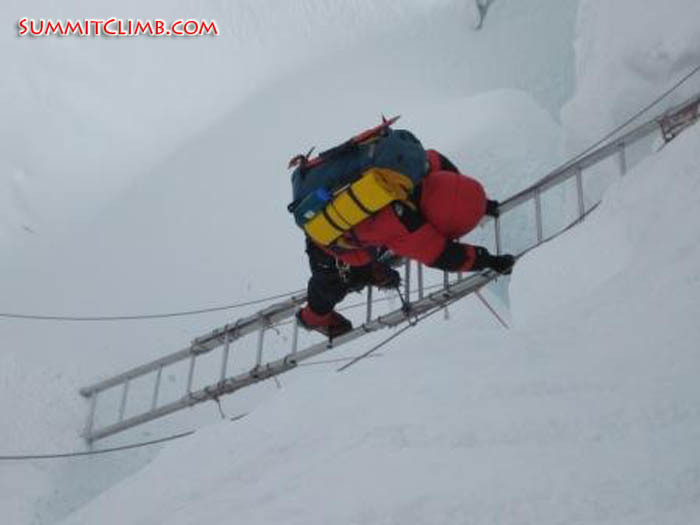 Crossing a ladder to the North Col (Arnold Coster). This morning our 2nd summit team summitted. They had a little delay in the night, because they had to wait for the wind to die down. Most of them sleep in Camp 3 tonight, only Leifur and his Sherpa Gaylgen are in Camp 2 at 7800m. Tomorrow when I have more information I will post names and summit times. Urs, Jerry, David Roeske, Lakpha, Lakpha Nuru, Palden are all back in ABC enjoying the food Samdien made for them. A line of Lakpa Gyelu waving to the camera on his way up the snow slope between camps 1 and 2 (Gordon Hopper). Climbers ascending the headwall towards North Col at 6600 metres (Thorbjorn Lundsgaard). Gelje Sherpa just below from Summit. Photo Martin. Bo Belvedere at camp 1. Photo Martin. This morning our first members summited. Urs & Lakpha Sherpa and David Roeske & Lakpha Nuru Sherpa summit around 10am Chinese time this morning. Unfortunately Jerry & Palden Sherpa turned around at 1am Chinese time. It was a very windy day and not an easy summit. 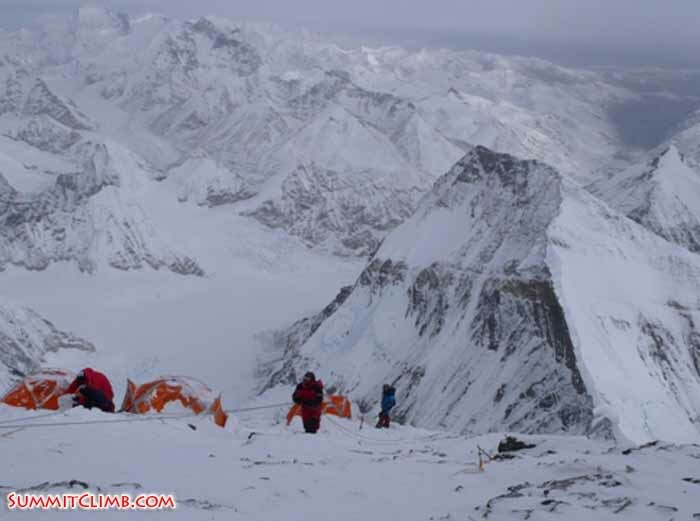 Urs, David, Lakpha and Lakpha Nuru are resting in camp 2 at 7800m and will descend to ABC tomorrow. Jerry and Palden descended to the North Col and they will be back in ABC tomorrow also. 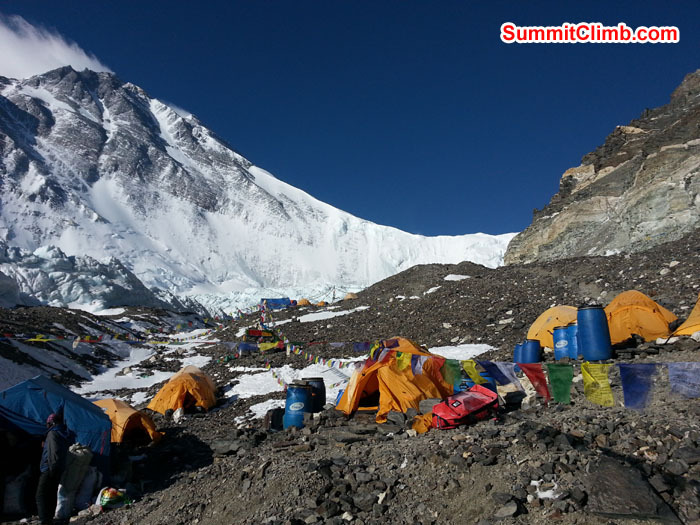 The 2nd team (9 members & 9 Sherpa) are in Camp 3 and will push for the summit tonight. 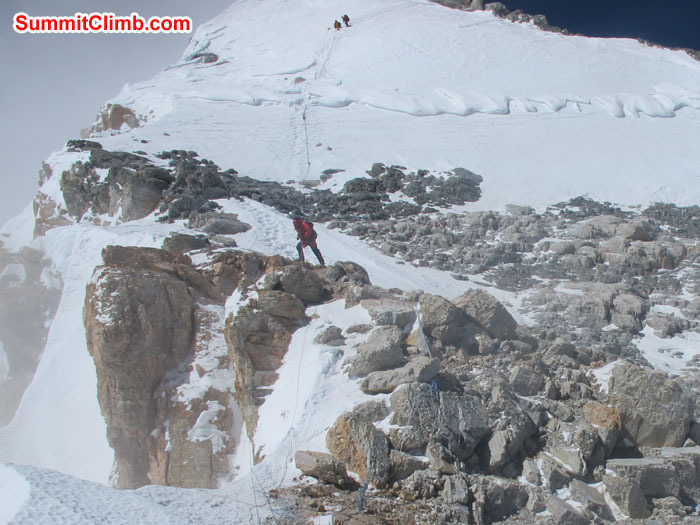 Bo is trying to summit from camp 2 and will leave tonight also. I hope tomorrow I have more good news! Summit of Everest by Urs. Photo Urs.Team on their way up the 2nd Step (David O'Brien). 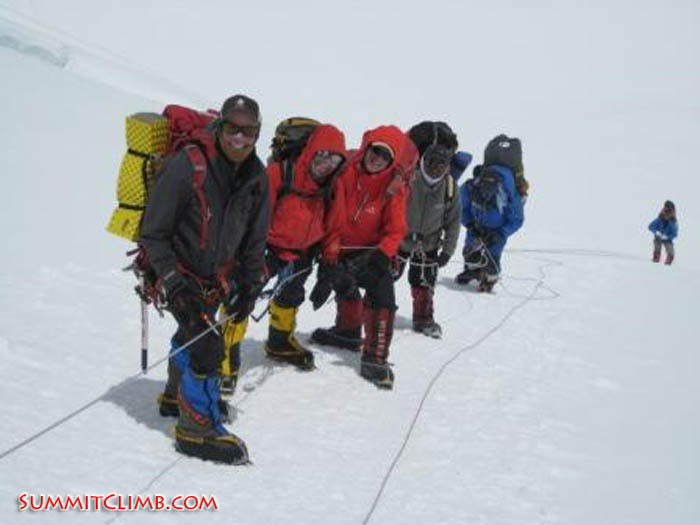 Our first summit team reached camp 3 at 8300m in good time. Urs & Lakpha Sherpa, Jerry & Palden Sherpa, David Roeske & Lakpha Nuru Sherpa are resting at the moment to get ready for their summit attempt tonight. 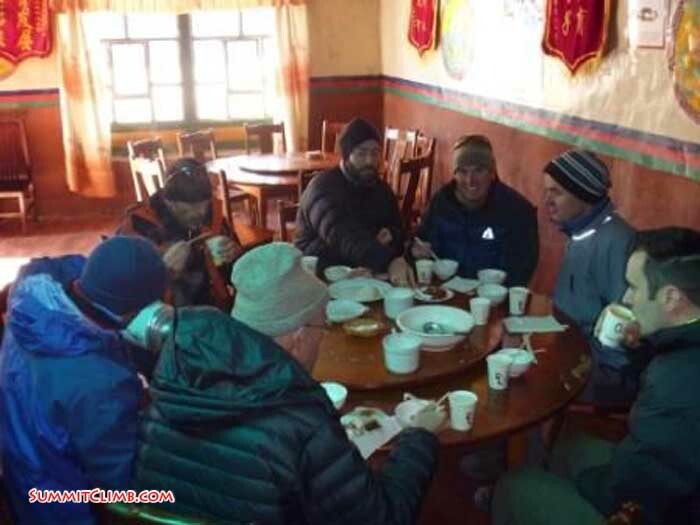 Depending on conditions they probably will set off at 11pm Chinese time and are hoping to summit on the 22nd in the morning. 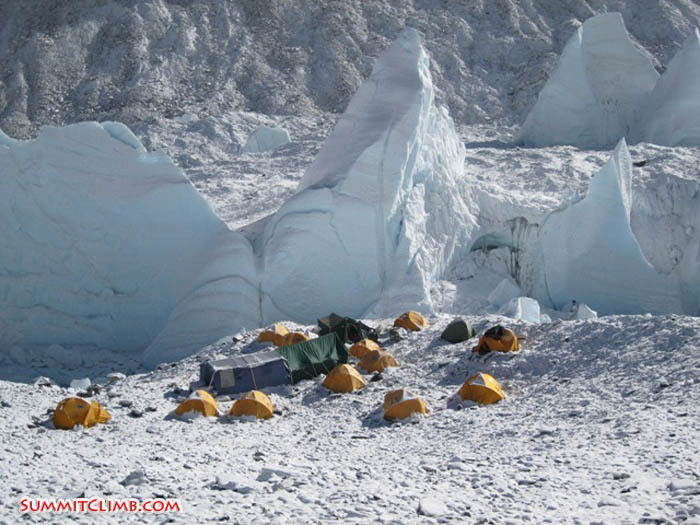 The rest of the team is in Camp 2 at 7800m spending the night and will climb to Camp 3 the following day. Their plan is to summit on the 23rd. Also this team is doing well and all members reached the camp in reasonable time. So I hope I can call in the first summits tomorrow morning, stay tuned. Camp 3 and surround views. 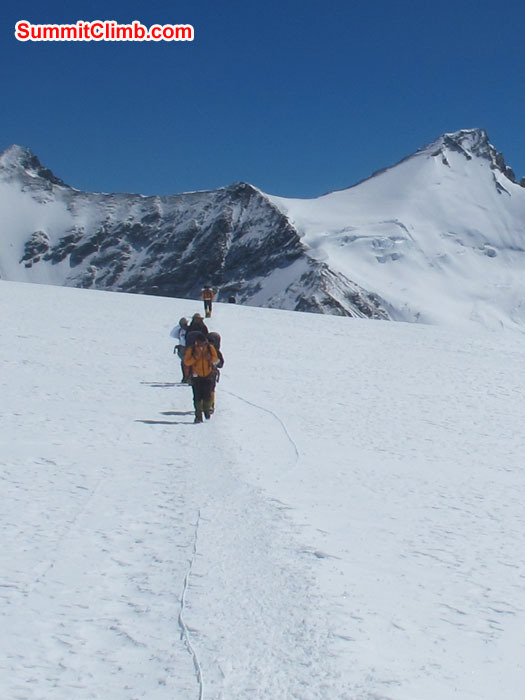 members heading for the summit (Arnold Coster). Bo Belvedere at camp 3. Photo Martin. Above Camp 2 near to Camp 3 where you don’t using crampon because of too much rocks. Photo Martin. Rikke at Camp 3. Photo Martin. 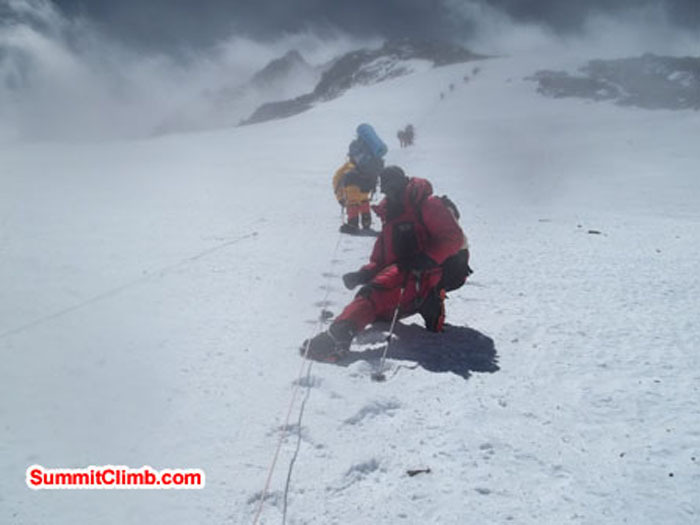 The Summit group who left yesterday reached C2 at 7800m and is doing well and will be heading to C3 at 8300m tomorrow to position themselves for their summit push on the 22nd. 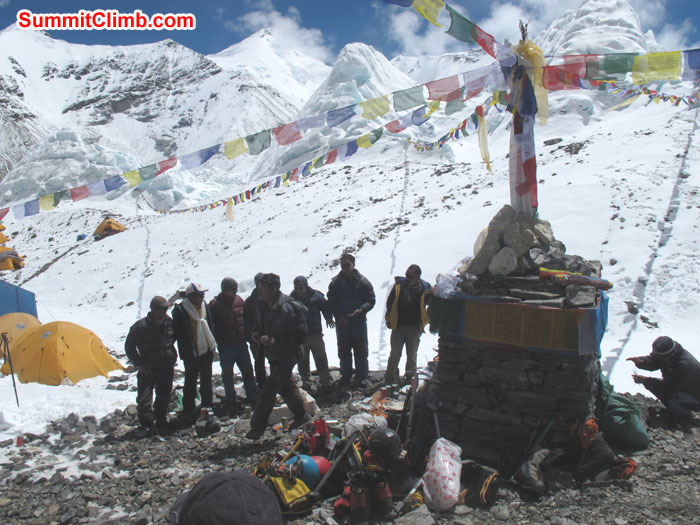 At the moment Urs, Jerry, David Roesky, Lakpha Sherpa, Palden Sherpa and Lakpha Nuru are in C2. This morning the rest of the members left ABC to position themselves one day behind the main group. They are all sleeping on the North Col tonight and doing fine. Unfortunately Moulay turned around today close to C2. He was having a hard time and decided to come back to ABC. 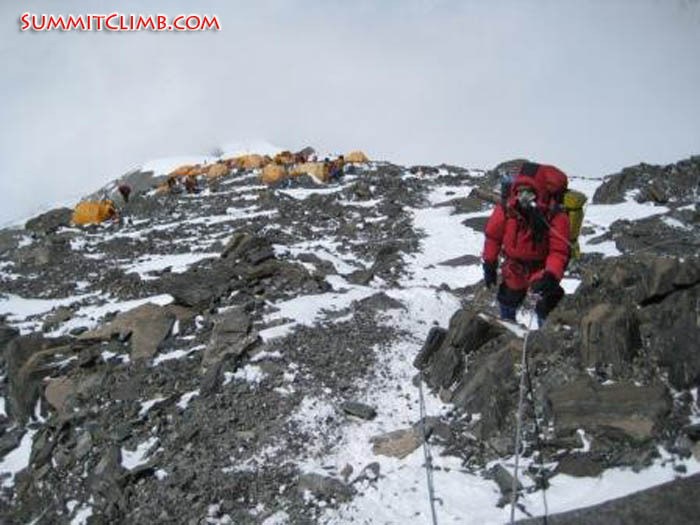 Rikke climbing up to Camp 2. Photo Martin. 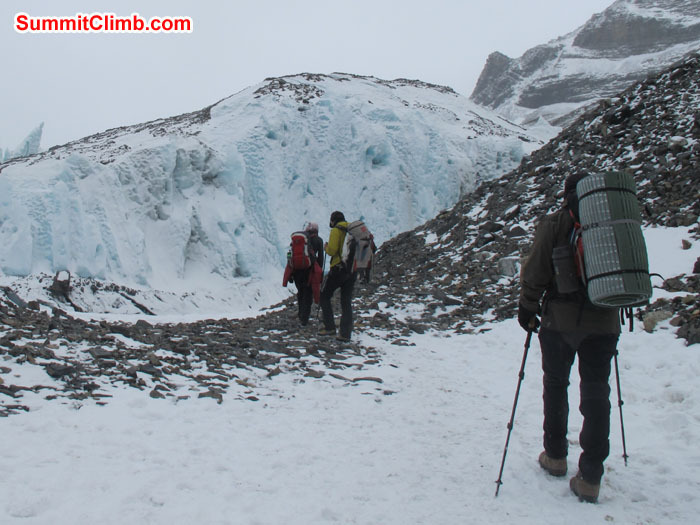 Climbing up to Camp 2. Photo Chris Bailley. 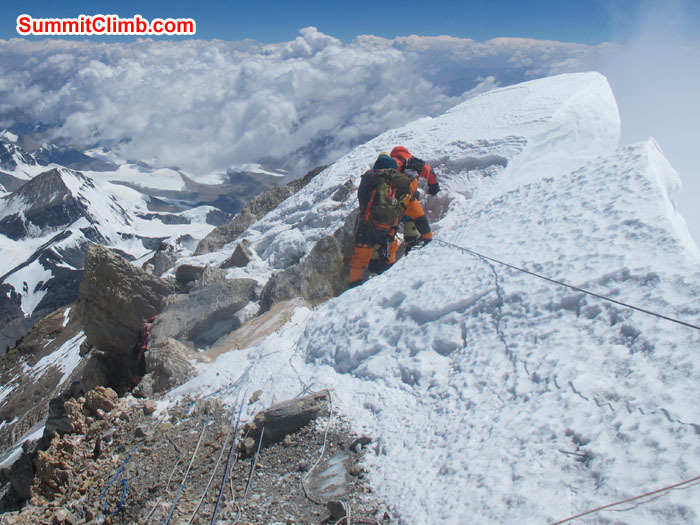 This morning the first members and Sherpas left ABC for the summit push. 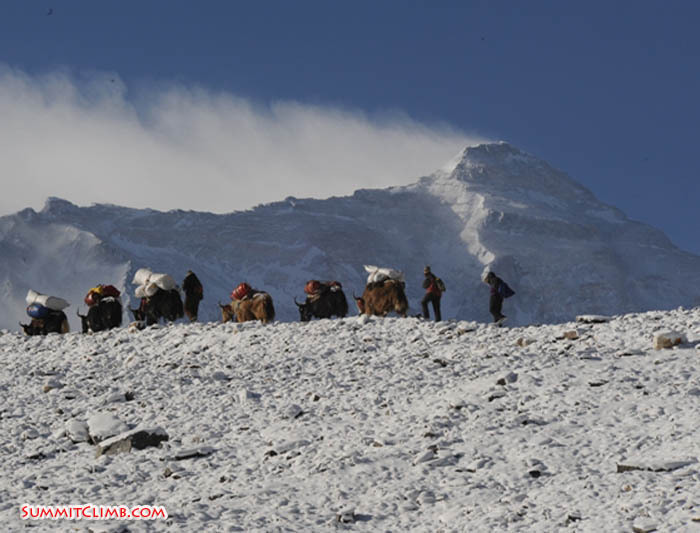 Urs, Garry, Moulay, Lakpha Sherpa, Dorje Sherpa andPalden Sherpa are climbing to the North Col today. The plan is to summit on the 22th, but everything depents on weather of course. So far the weather forecast looks good and many groups are heading for the summit right now. Tomorrow our 2nd group will head off to the North Col and are planning to summit on the 23rd, followed by a third group the day after. Tomorrow I will let you know who is in the 2nd group, just in case somebody will shift dates for the summit. David Roeske and Lakpha Sherpa are resting on the col at the moment and are planning to hook on the first summit group that is passing by. Everything is going well, so far, lets see what will happen in the next couple of days. Members resting at camp 1 (Beow Lim) . Members using fixed rope while going up to North Col. Photo martin. Just below North Col, members resting, Chris Bailley, David O'Brien, Rikke Hojland, Nganga Nuri Sherpa and Gelje Sherpa. Photo Martin. Climbing up to North Col with perfect day. Photo Martin. Yesterday and today our team climbed up to ABC again, this will be the last time we have to do the long walk between BC and ABC. Now we are waiting for weather, it looks like there are some opportunities to summit now, but the really nice weather will not show up until the 21th of May. So we will all rest a day more in ABC and check the weather again tomorrow. Today I also had my birthday in ABC, the 9th time on Everest! Our cook made a nice cake for me and the climbing staff gave me a box of Lhasa Beer. So everything is fine up here and tomorrow we will probably decided when to go up. Member climbing up at North Col. Photo Chris Bailley. 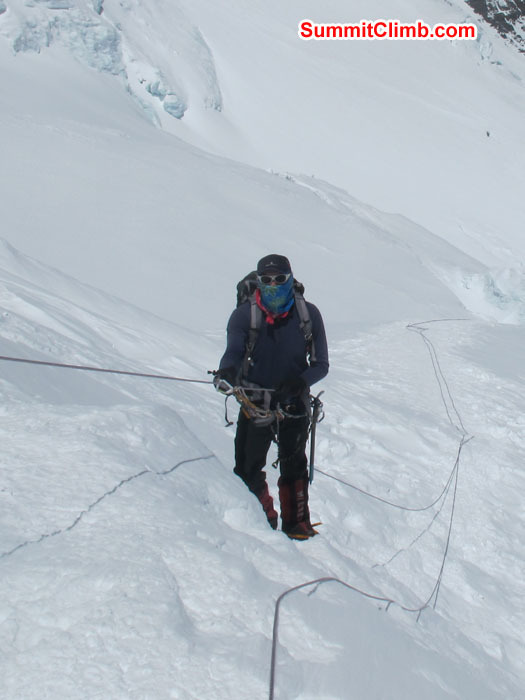 Member using fixed rope while climbing up NorthCol. Photo Chris Bailley. Close up look at Zoomer point. Photo Chris Bailley. Member approaching zoomer point. Photo Chris Bailley. The team is just relaxing in Base Camp at the moment and seven off us even went down to the town of Shigar which is around 4100m. We still want to wait and see what will happen with the first groups pushing for the summit and avoid the crowds. 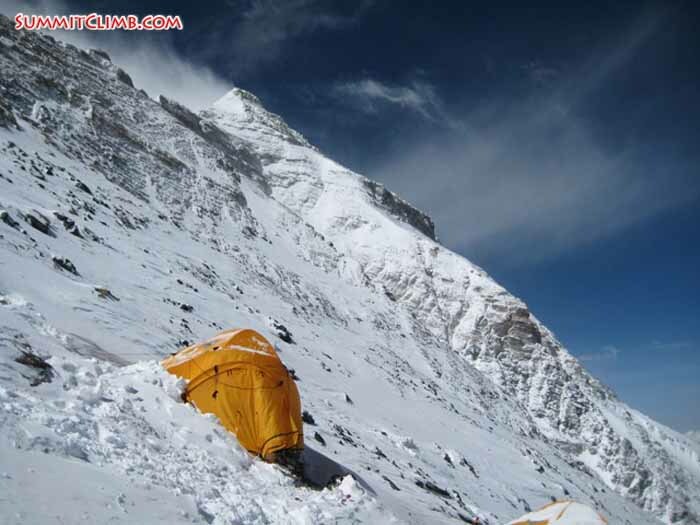 We will probably go up to interim camp and then ABC on 14-15 May and aim for a good weather window on the 20th at the earliest. 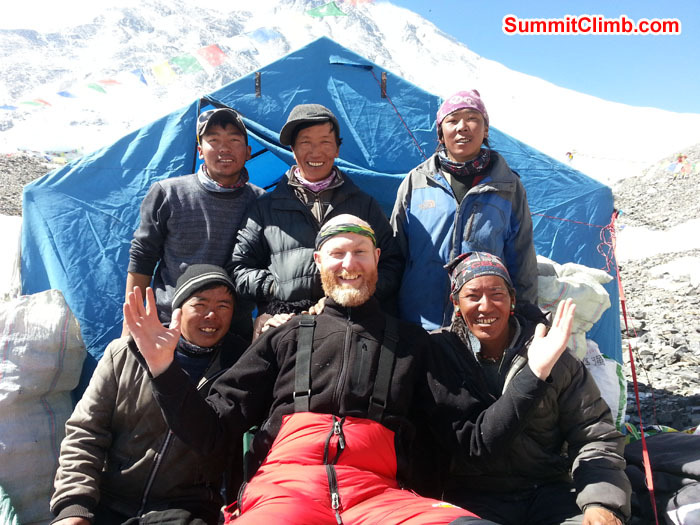 Most off the team is resting in Base Camp now, except David Roeske; he is the last member who arrived on the mountain and is trying to complete his acclimatization. The rest of the group is enjoying the luxuries of Base Camp: movies, internet, lots of food, showers etc. The weather is still not settled and is very windy on the mountain, also the route to the summit is not fixed yet. We hope the next couple days the wind will lay down and the route to the summit will be ready, until then we just stay low. All our members slept on the North Col a couple of nights and most of us even touched 7500m, so we all have a very good acclimatization. There are different rumors that the chines will push to the summit between 16-18 May, if this is true we probably move up just after this. Chris Bailley using ladder to ascent while Martin taking a picture of him. Photo Rikke. Chris Bailley carefully climbing up. Photo Rikke. Hi everyone - this is Matt Taylor from England. I arrived at Advanced Base Camp yesterday with Shivesh from USA after an 8 hour walk up from Interim Base Camp. On the way up we walked along a stone moraine with amazing valleys of ice seracs, some up to 200ft high either side of us! We were greeted by our friendly Sherpa and kitchen staff team and we settled into camp life at 6400m, with some delicious warm food and good company. Half of the Everest Summit team had already left ABC for the North Col, whilst the other half remained in ABC to rest until today. So as of this morning all the Everest summit team have departed ABC for time on the North Col and they are all doing really well. Shivesh and myself are aiming to summit on the North Col and we remain in ABC and look forward to taking it easy and resting as we acclimatize to this new altitude. Everything is OK - we miss all our families and friends and we look forward to sharing more updates with you as we make progress. 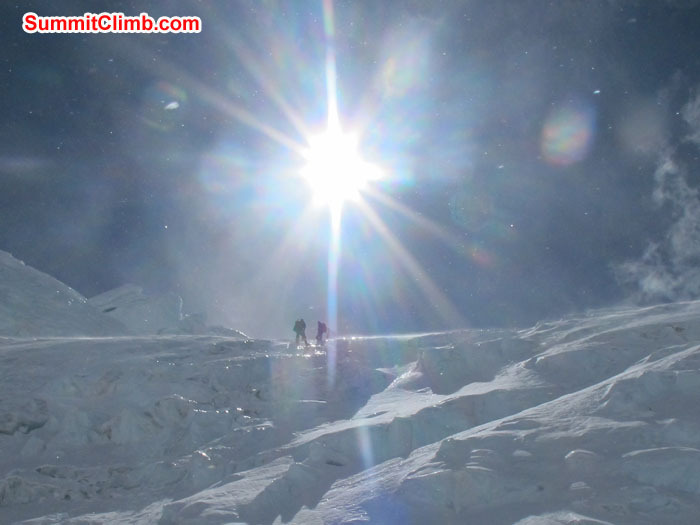 Thanks for following the Summitclimb Everest Tibet and Everest North Col expeditions. North col camp in foreground. Background-slope to camp 2, then full route to c3-summit ridge. 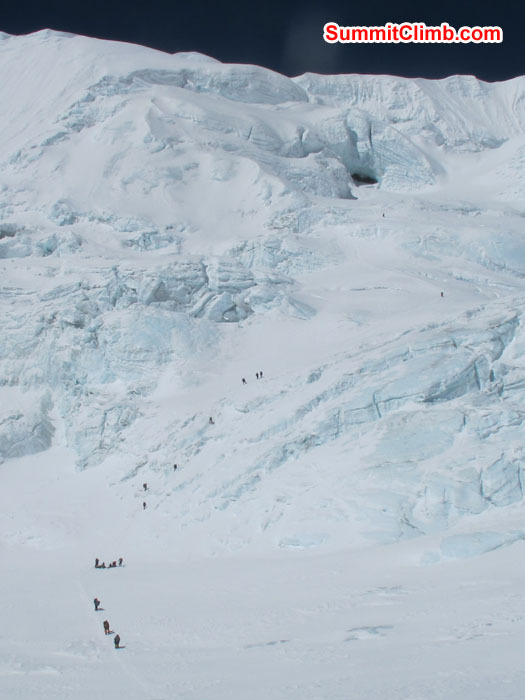 Look closely and see a line of 50 sherpas on the snow slope (Dan Mazur). 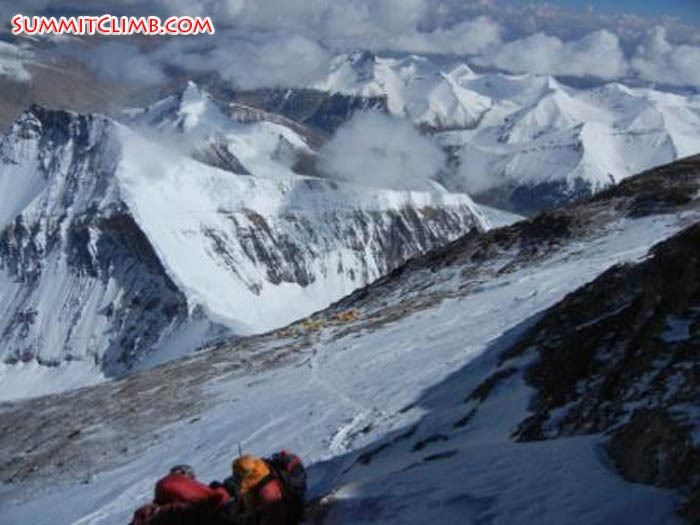 Hello SummitClimb News this is Arnold the leader of the Tibet climb and I’m calling from interim camp at 5850m. Today we were the second group who went up to ABC, yesterday there was a group of 9 who already went up there and Bo never actually left ABC so right now there are 10 people in ABC and now 4 Everest climbers are on the way and are going to be there tomorrow. We’re all together with the North Col climbers; Matt and Shivesh. 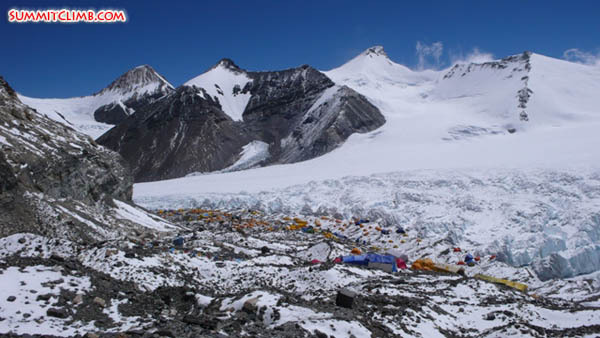 They are doing fine and have spent their third night at altitude they will spend another two nights here at interim base camp before they continue to ABC. Our sherpas have already been up in ABC for a couple of weeks and are happy to see us and with their help we will be all set for our second location where we hope to touch 7500m as part of our acclimatisation. Today was slightly windy, I’ll call again tomorrow from ABC to update you with the plans. Yaks at ABC behind Lakpari. Photo Rikke. Yak ready to go ABC with loads. Photo Rikke. Base Camp, you can see clear view of Mt. Everest. Photo Rikke. Bags are ready to go ABC. Photo Rikke. Lots of yaks carrying load to ABC. Photo Rikke. Member hiking up to ABC. Photo Chris Bailley. Today was our 2nd day of rest in Base Camp and tomorrow about half the group will go up to ABC again. We spent our days sleeping, eating, reading and watching movies in Base Camp, a welcome change after the cold and windy ABC. Also our two North Col Members Avi and Jeremy left our team today and are on their way back to Kathmandu. So tomorrow our 2nd rotation starts where we will try to sleep on the North col a couple of nights and touch 7500m. This will finish our acclimatization. 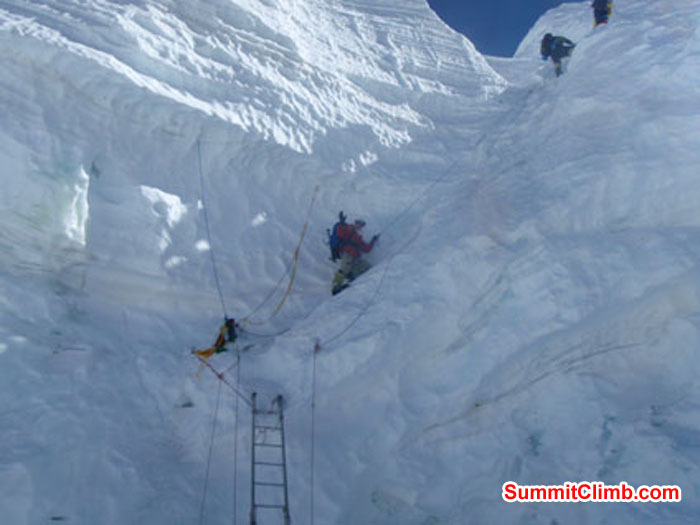 After this we will go down for our last rest in Base camp before the summit push, which is still many weeks from now. The 2nd half of our team will go up a day behind the first group (tomorrow). This will give us some more space and will make logistics easier. Right now it's windy on the mountain, but better weather is forecasted. View of North Col from near crampon point (photo by Jeff Botz). Hello SummitClimb News.This is Arnold; the leader of the Everest Tibet climb and I’m calling from ABC. Today was very windy and cold day and yesterday was the same. We decided to climb the North Col with some team members yesterday but it was very cold and windy and only one of the team managed to summit the North Col. However as I have said before, other members have tried and we have all week here to summit the Col and some already reached the summit because the day before was nice and warm without any wind. It looks like we’re all going to have to go back down to basecamp now and get some red blood cells, relax and recover and we’ll come back up to ABC in about a day or three. Our schedule allows for breaks like this so that we can relax and in a few days return to ABC and try reach the summit of the North Col again and spend a couple of days at around 7000m on the Col and then we’ll go back down to basecamp for the final rest. But first the weather has to get better, it’s very cold and windy like I said before so now we’re about to head down and then return when we are all feeling better again. So I’ll call again when we are in basecamp to let you know that everybody is sound and safe. Rope training. Photo Arnold Coster. Martin taking rest while going to Camp 2. Photo Rikke. WE are all safe and sound in ABC at 6400m. Yesterday we did our rope practice on the ice towers near our camp. Everybody did very well and is also a good test to see if you are ready to go any higher. We practiced: ice climbing, rappelling, overcoming nuts in ropes etc. Today we walked to crampon point and some members even to the start of the fixed ropes of the north col.
Our strong Sherpa team went up to the col to check out conditions for us and pitch our camp. Hello SummitClimb news. This is Arnold the leader of the Everest Tibet climb, North Col climb and ABC trek. Today we had our second day in ABC and two of our Everest members arrived here in ABC: Moulay and another member. Everybody has been fine although the first night was rough we’re all adapting to the altitude and the first couple of nights are usually tough. We’re still waiting for one member; Jeremy, one of our North Col members. He decided to take a little bit of extra time in interim camp. Tomorrow we expect Jeremy to join us and then the whole team will be here. Tomorrow we also have our Puja ceremony here is basecamp and the afternoon will be free. The day after tomorrow we will have a very hectic time. ABC seen from slightly above (Dan Mazur). 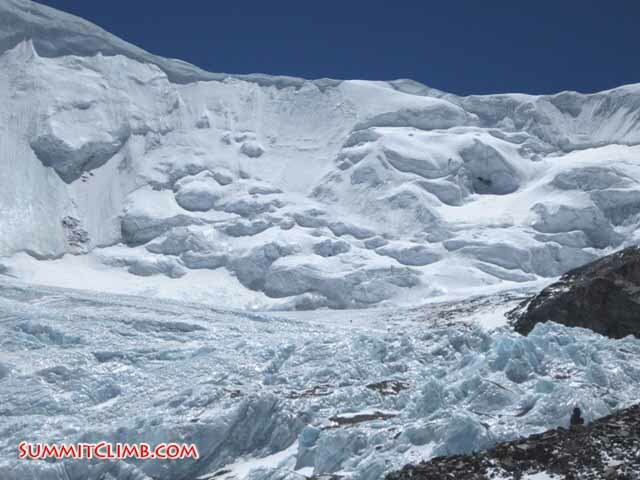 Hi this is David from the SummitClimb Everest North expedition. We’re at interim camp which is between basecamp and ABC. We came up here yesterday and it was lovely weather, no winds, very sunny and arrived at a well made-up interim camp. Last night it started snowing and it’s snowing again today and we’re on a rest day so everyone is staying here at interim camp resting. Tomorrow we will carry on up to ABC. We’ve just had a lovely lunch of beans, yak meat and rice and meals prepared without the yak meat for the vegetarians. We’re looking forward to a bit more rest this afternoon and some dinner and then heading off to ABC tomorrow. 5800 metre interim camp located on Rongbuk Glacier taken on a snowy morning. Yaks moving along trail to ABC below Everest (Gordon Hopper). Hi, this is Morten with today's dispatch from BC. The climbers have packed their gear for ABC and the yaks have started the ride towards ABC fully stocked. Some of the group members went to the Rongbuk monastery just one hour walk north of BC. The visit at the old monastery was part of the preparation for the puja at ABC. Love and hugs to all our family and friends. Looking forward to get you all the stories when we have succeeded our tasks. Preparing for Puja Ceromony. Photo Rikke. Preparing tea for Puja ceremony at Everest Basecamp. Photo Rikke. Yaks are ready to go ABC carrying grasses. Yaks around the Chinese base for load the expedition loads. Photo Rares Voda. Yak drivers waiting for expedition load at Chinese base camp. One of the strong Yak is ready to go with loads of food. Photo Rares Voda. Our tents at Chinese base camp with clear view of Mount Everest. Members ready for hiking up to ABC. Photo Rares Voda. This expedition had kind of a rough start from the beginning. The border between China and Nepal was closed for foreigners for nine months and the Chinese authorities checked us all very carefully. This slowed down our border crossing a lot and we were only able to reach Zhangmu that day. No problem though, because this gave us an extra day in our acclimatization schedule. The next day we headed off to Nyalam at around 3600m and did a beautiful acclimatization hike in fresh snow. 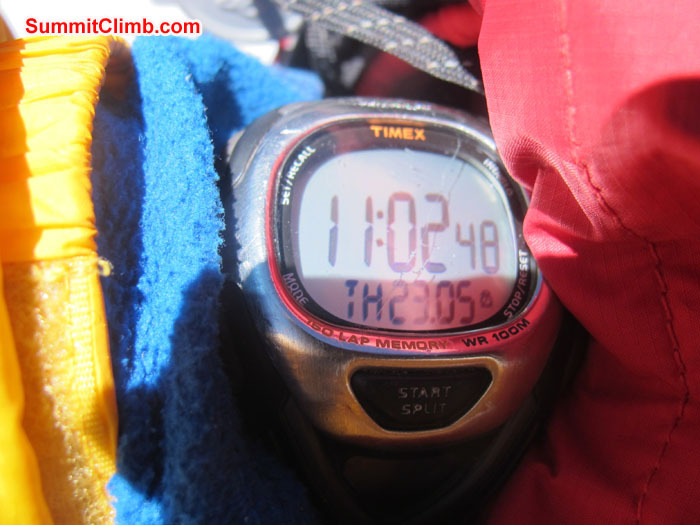 On the 12th we moved on to Tingri at 4300m, again we had a delay. The clutch of our vehicle burned out and we had to wait in the middle of the Tibetan plateau for a replacement vehicle. In Tingri we went for a short hike to a viewpoint where you have the best views of Everest and Cho Oyu. The last two days we spend hanging around Base Camp. Today we loaded our Yaks and they went up to ABC together with some of our staff to prepare the camp for us. All the members went to the old Rongbuk monastery to get the blessing from Lama Sange. So after a rough start all is fine again, tomorrow we will spend another day in BC. 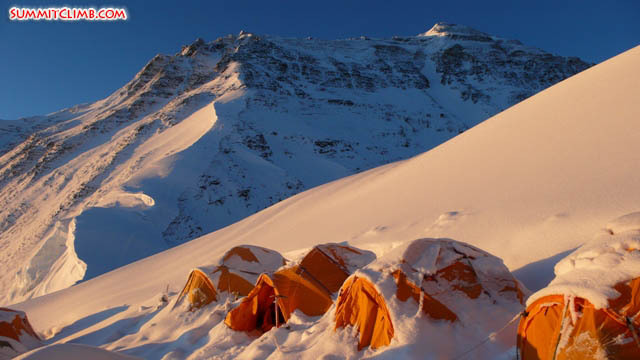 We are planning to move to interim camp at 5850m on the 19th. 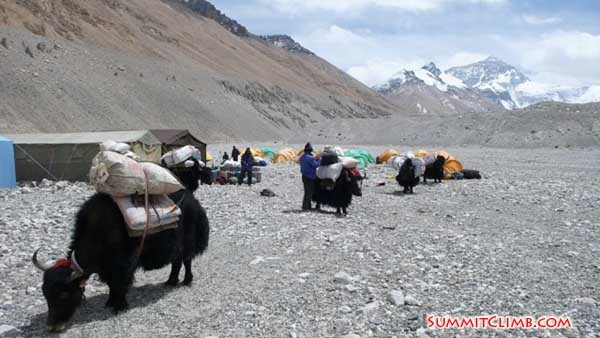 Yaks in basecamp being loaded for the trip up to interim camp, Everest behind (Dan Mazur). 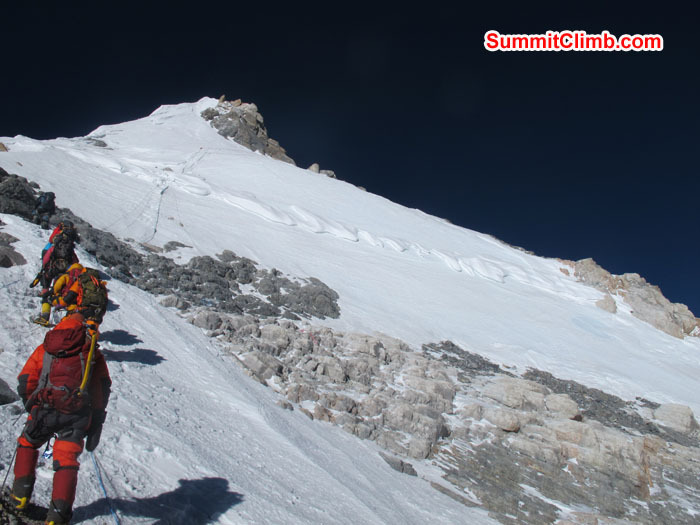 Hello SummitClimb News. This is Arnold; the leader of the Everest Tibet climb. I’m calling from Tingri at 4300m. Today was our second day in Tingri. Next we will move onto basecamp and it’s the last time we will get a chance to sleep in buildings before we move to our tents. Yesterday we all went for a hike and enjoyed the views of Cho Oyu and Everest which are absolutely magnificent. At the moment we are waiting for our bus which will take us to basecamp. This is about a three and a half hour drive after which we will meet our staff and our cooks. They have already made basecamp ready for us so we don’t have to do much – just eat and go to bed. 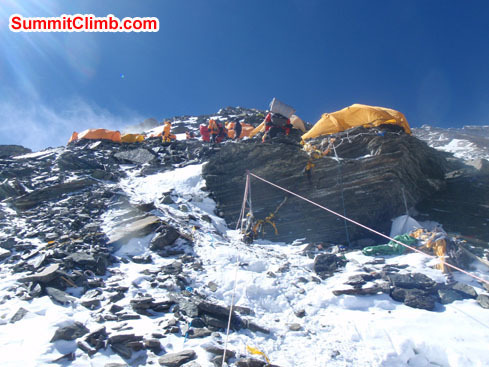 Hello SummitClimb News. This is Arnold Coster; the leader of the Everest Tibet climb. I’m calling from Nyalam which is about 3700m high and for our group this is the second day in Nyalam. Our crossing of the Chinese border at the Kodari Zhangmu was a little bit slow because we were the first western group after a long time that was allowed to cross, so it took up most of our day! So two nights ago we stayed in Zhangmu and the next day we continued to Nyalam which is where we are today also. Today we went for a nice acclimatisation hike to about 4000m and we had some fresh snow which gave us some nice views with a little bit of snow cover on the mountains. Members relaxing in a restaurant on the way to basecamp. 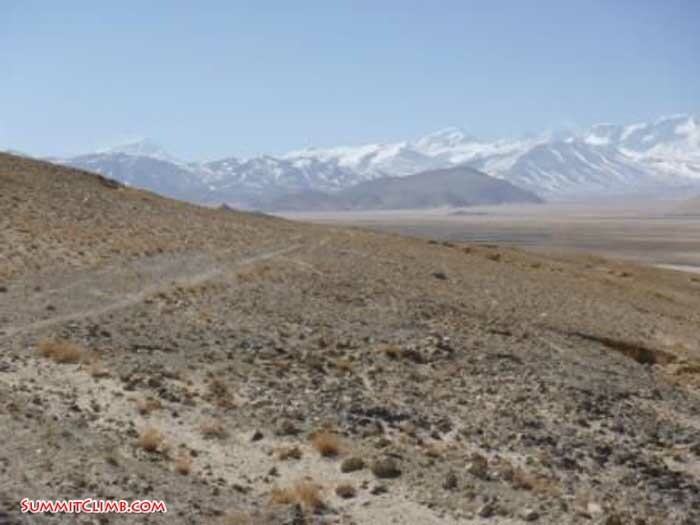 A clear view of the surrounding Tibetan Plateau (Arnold Coster). After clearing Tibetan customs and immigration yesterday, a Chinese bus took us up the windy road through the rolling hills to our comfortable hotel in Nyalam town at 3,750 metres/12,300 feet. The smaller towns in Tibet are generally simple and rustic places, and this one is no exception. The topography here is quite interesting in that we are perched in the transitional zone where the Tibetan plateau rams into the Himalaya, then drops into the forested valleys and jungles of Nepal, and finally out into the Gangetic plain of the Terai and India. We will stay over one extra night in Nyalam, to help adjust to the altitude, and during our "rest-day" take advantage of the interesting surroundings to walk to the top of local hills and savour the first glimpses of the Himalayan Giants. 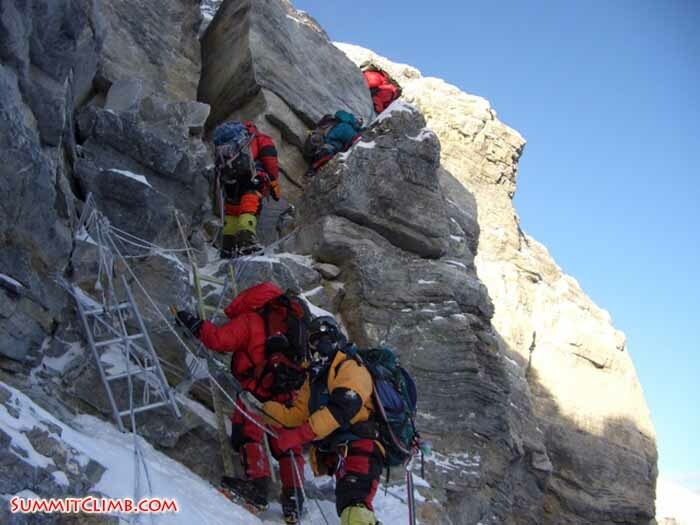 All members are doing well, acclimatizing, resting, and getting excited for our main objective of Everest. 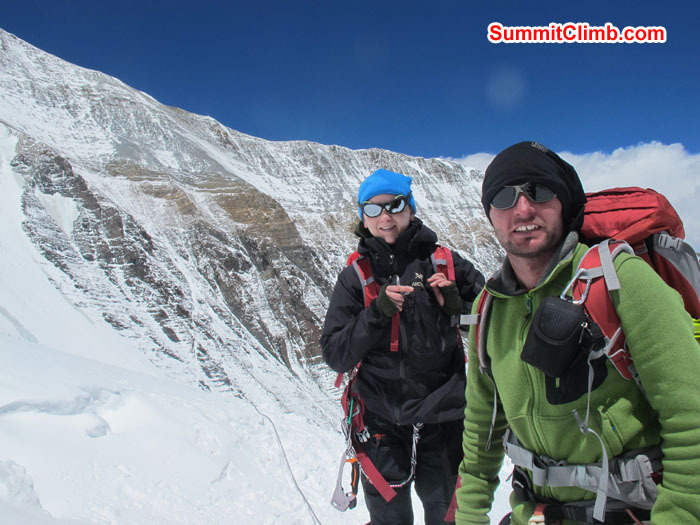 Thanks for following the news at SummitClimb and stay tuned for more news. Shyambhu Nath Stupa and one of the Hindu temple in Shoyambhu. Player flag around the Shoyambhu Nath. Photo Rares Voda. Locals buying fruit locally in street. A Dhunge Dhara is a traditional stone water tap found extensively in Nepal. Photo Rares Voda.